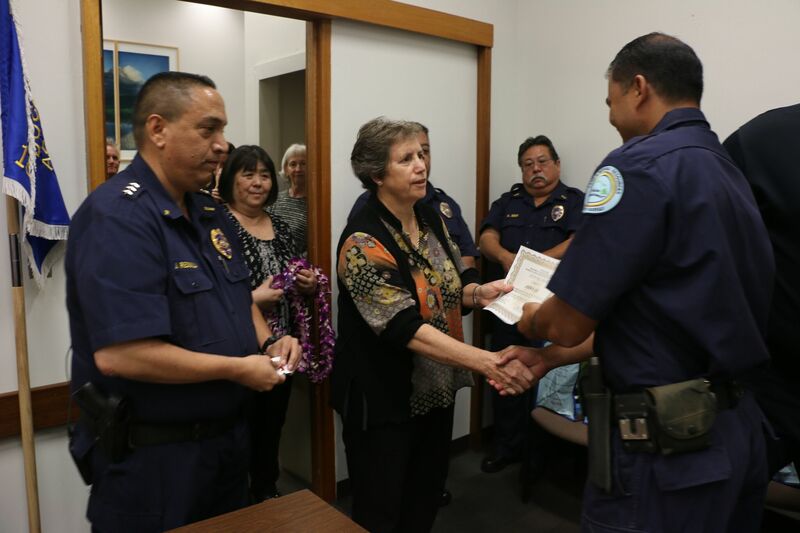 (Honolulu) – On Friday, four officers with the DLNR Division of Conservation and Resources Enforcement (DOCARE) were recognized for their efforts to revive an unconscious, lifeless man at Keehi Small Boat Harbor on O‘ahu in July. Acting DOCARE Enforcement Chief Jason Redulla presented the four officers with certificates during ceremonies at the conclusion of the first graduation for officers who’d trained at the new DOCARE Law Enforcement Academy. Redulla said life-saving is the highest of traditions in the law enforcement profession and it exemplifies protecting the public. The officers honored were Jason Lee, Woodley Harrington, Patrick Chong-Tim and Vance Lime.